Paul Tejera was born in Havana, Cuba and currently lives in Islamorada, FL. 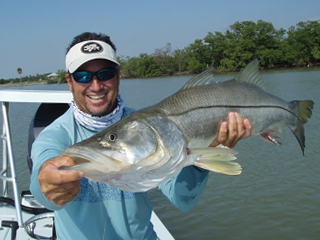 He specializes in fly and light tackle fishing the waters from Biscayne Bay to Key West and Everglades National Park and especially enjoys fly casting instruction and sight fishing the flats. As the owner of Backbone Lures and Flies, he has developed a unique group of flies and lures which are specially designed and suited for the style of fishing he enjoys. Paul has hosted groups and taken groups on fly fishing trips to locations such as Los Roques, Venezuela for bonefish, permit, and tarpon, Iztapa, Guatemala for pacific sailfish, and the Amazon River in Brazil for peacock bass. As a tournament guide, Paul has an impressive resume of championship results which include both tarpon and bonefish tournaments. He has been guide to the grand champion in the Golden Fly Tarpon Tournament and Poor Boys Tarpon Tournament on four occasions. He has also been guide to the grand champion angler in the Gold Cup and Don Hawley Tarpon Tournaments, the Spring Fly Bonefish Tournament, Redbone Celebrity Tournament, Spring All-Tackle Bonefish Tournament and a Best of the West Fly Casting Champion. He has been tournament director for the Backcountry Fly Championship for 5 years, and the “Fish ‘til You Lose It” Backcountry Fishing Tournament for 15 years. Paul retains a very low key and humble demeanor, encouraging and helping his clients become better anglers.